S and I didn’t enter into cohabitation lightly. We discussed what moving in together meant and we discussed how we’d make it work. Being the big nerds we are, we read books on the topic and came up with some plans in advance. For example, because we both fall on the introvert side of the spectrum, we knew we’d need to plan some alone time (or pseudo alone time) into our life together to avoid one of us (probably me) getting a little twitchy and eventually snapping. We told each other in advance that, hey, if one of us needs time alone, it’s not personal – it’s just necessary to recharge our introverted batteries. We also build in together-but-alone time by switching off on dinner duties. While one person cooks, the other is free to go read a book or play Half-Life 2 (spoiler: it’s not me) in the other room. And I get some alone time every Sunday when S records his podcast in the bedroom – he shuts the door and I have the rest of the apartment to myself. Yesterday, I filled that hour by reading A Clash of Kings and making granola. This granola was meant for the week ahead, but it’s so easy to munch a clump while walking through the kitchen that I admittedly don’t have as much as I wanted left over. But that’s okay. On Friday we’re heading to Rhode Island to hang out with my family, so I’ve got a four-day work week and don’t need full granola supplies. I will surely enjoy what remains, though – this is solid, simple, and delicious granola, a good base for any additions you might want to add. The only added fat is coconut oil, which I will exclusively use in granola in the future – it adds just the right hint of flavor without being overwhelmingly coconutty. And I’m a sucker for anything with Medjool dates – I can’t get enough of their unique caramel-y taste. The recipe is here, although I left out the chocolate chips, upped the spices, and used some agave along with the brown rice syrup when I ran out of the latter (pantry decimation, woo!). Next time I’ll add other dried fruits and perhaps some dark chocolate chips. What’s your favorite granola recipe? What’s your favorite thing to do when you’ve got some alone time? I recently tried homemade granola for the first time. 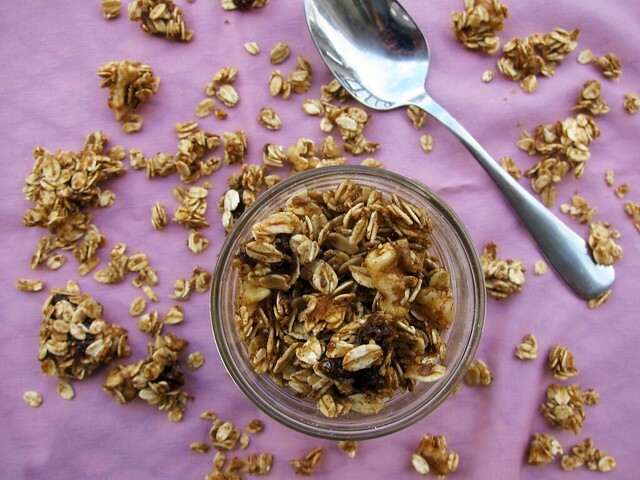 I was blown away by how easy it was and will never go back to store bought granola. I like to keep it simple…http://inherchucks.com/2012/06/22/homemade-granola/. But your add ins sound pretty yummy! I am certainly not introverted but I needed my time away as well. Mom and I always felt that we had to maintain our three entities, us, me and you. The goal was to never let the “us” time smother the other two. Of course the birth of you (and later your siblings) added the “we” to that group. I often regret that there wasn’t more “we” time and a lot less me. See you soon, Dad.